I was born in a small city on the eastern coast of the Salado del Norte river, in San Justo, Santa Fé, on October 17th, 1960. I wasn’t 5 years old yet when I moved to Buenos Aires. I’ve always enjoyed painting, read the History of the world and watch TV. I’ve taken piano lessons several years, practiced athletics and abandoned both to concentrate on my studies undertaken in the Faculties of Law and Sociology (UBA), done at the same time than does of painting, at Guillermo Kuitca’s studio. I started out exibiting my drawings, then my paintings, installations and later on my performances. It’s been between 18 and 24 years of exhibitions already. Since 1995 I practice bodybuilding and since 1999 I’ve been mixing art with social sciences through a series of installations (quite pictorial) and performances in which writing, acting, painting and bodybuilding gymnastics are met. 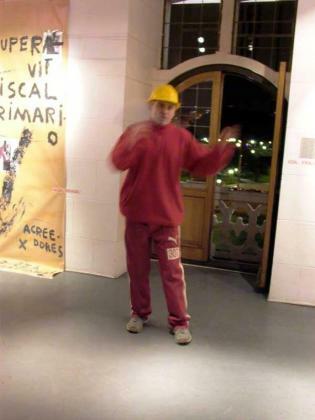 Since 2002 I’m a member of Proyecto V.
I teach: a) Theorical and practical seminar on the missing links between art and society; on different higher education institutes and on my own; and b) as a personal trainer in gyms. I play a character who has a secret mission entrusted by the National Minister of Infrastructure, of finding new oil and gas reserves within the national territory and during a very important moment of negotiation of the foreing debt to leave a default of payment state. He is dressed as a miner because, on his route, he leaves from Santa Cruz and reaches, on his continental route, the English Tower building (action), from where he’ll head for the Amazon. The piece that represents me is not just one, it is a period that begins in 1999 up to this day. It consists of a group of ideas that will be painted, according to the intention, and the themes might be painted before hand or in the moment; the second case is what allows me to paint in public and I feel like a fish in water. The material are biros with which I underline and mark everything I read in books, newspaper articles, photocopies – until feeling a fever of the mind – and then it is the passage to the two-dimensional plane which generates a feeling of pleasure and relief, in which I begin using graphite, chalk and paint which I disseminate with rags, sticks, spoons, spatulas, hands, or I chuck it in the style of “action painting” on my favourite support which is paper. I do not like the preoccupying formality of the art spaces, I detest mounting as a problem; one has to simplify due to a problem with the social division of labour and costs; in truth it is an anti-industrial relationship in its effects, since the causes that may justify the expense and complex pieces do not appear represented to me. My most carnal referents are pictoric along the entire history of art; I think of the abstract images of Lascaux’s cave, Fantin La Tour, Corot’s atmospheres, Millet’s farmers, the Italian futurists, Duchamp’s Woman descending a Staircase, Max Beckmann’s portraits, the North-American abstract expressionists – all of them – Tàpies, the German painters of the 80s new image, etc. As regards Argentina I increasingly enjoy looking at paintings by Sívori, Victorica and Luis Frangella. To conclude the conceptual strength of Roman Opalka – unforgettable Reencontre par séparation – and the materiality of Anselm Kiefer. I recall the exhibitions by Liliana Maresca at the Cataluña Casal, Maresca Sells Herself (Maresca se vende) in 1993: synthesis of concept and expression; also her installation at the Recoleta C. C. with the cement boxes. The groups I perceive coincide with the changes in the relationship of the social system to the artistic system as of the “collective transition” of the artists in 1998, when it collapses into a void of meaning. The result is very positive as of that point. There is diversity in the roles of the system of art revolutionised by the artists and not by the critics or the institutions that legitimise the “art system”. The artists are curators, they are increasingly writing more about exhibitions and teach theoretic issues, without abandoning the practice. There is precedent to mark the recent changes in history which is the role of Gumier Maier of the Rojas C. C. from the end of the 80s, that inaugurates a whole new process in the artist-curator, then the appearance of Beauty and Happiness (Belleza y Felicidad) in 1999 with Fernanda Laguna at the head, of ramona magazine in 2000 and the artist-curator Marcelo de la Fuente’s public management at The Olivera House (La Casona de los Olivera) – as of mid-2000. The styles of the artists diversified, there appeared a loss of the fear to show what before used to be an in-house activity; and that happens with all techniques.